the Antarctic ice cap is melting fast. The melt is attributed mainly to global warming. Now there is evidence of a volcano beneath the Antarctic ice sheet. Scientists say it would also be contributing to the melt. The volcano erupted more than 2,000 years ago, and the area where the ash fell is spread over 23,000 sq km below the ice sheet, showed the findings of two researchers of the British Antarctic Survey who analyzed radar signals from the Hudson Mountains on the West Antarctic ice sheet. "The eruption was the biggest in Antarctica in the past 10,000 years. It blew a substantial hole in the ice sheet and generated a plume of ash and gas that rose up to around 12 km in the air," said Hugh Corr, a researcher, in a media release. He said the heat from the volcano, along with other subglacial vents, causes the surrounding ice to melt. The water collects to form subglacial lakes and acts as a lubricant at the base of the ice sheet. 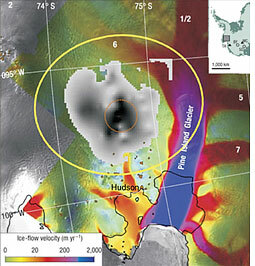 The Pine island glacier, located near the volcano, has been observed to flow faster towards the sea in recent decades, and the authors infer that it could be because of the lubricating effect of the melt-water. The water, however, did not affect other neighbouring glaciers on the West Antarctic sheet, which are also receding. The researchers concluded a warmer ocean due to the rising global temperature may be the reason for this widespread melting and the resulting sea level rise. Radar track The mass of ice falling into the ocean has increased by 75 per cent over the past 10 years. Radars and satellites have been used to collect data of a number of geological features beneath the ice cover in Antarctica since the 1970s to study the melt. In the study, published in the February issue of Nature Geoscience (Vol 1, No 2), the data was recorded by bouncing radio waves off the ice sheet during a 2004-05 aerial survey. The researchers found that the reflections originated from the middle of the ice depth. Taking into consideration other observations such as the unusual strength of the reflection, the elliptical shape of the reflected area, the way the area faded from the central region towards the boundaries, and reports of nearby volcanic activity, the researchers concluded that the reflections came from remnants of a volcanic eruption.